[Super 73] make electric scooters, and they made some Star Wars Speeder Bikes with a twist for Halloween; adding some mirrored panels around the bottoms of the bikes made for a decent visual effect that requires no upkeep or fancy workings. Having amazed everyone with the bikes, they followed them up with a video of the build process. The speeders are shells built around their Super 73 electric scooter, with bases of what looks like MDF sitting on anchor points. Onto the base platforms goes cardboard and expanding foam to create the correct shapes, which are then sanded then coated in fiberglass and bondo. Then it’s time for paint, weathering, and all the assorted bits and pieces needed to make the speeders as screen-accurate as possible. The real finishing touch are the mirrored panels to conceal the wheels and create a levitation illusion. As long as the mirrors are angled so that they reflect the pavement when viewed by a pedestrian, it works fairly well. Top it off with costumes and a ride around town (with plenty of cameras of course, they naturally wanted to grab some eyeballs) and we have to say, the end result looks nifty. Both the showcase and making-of videos are embedded below. 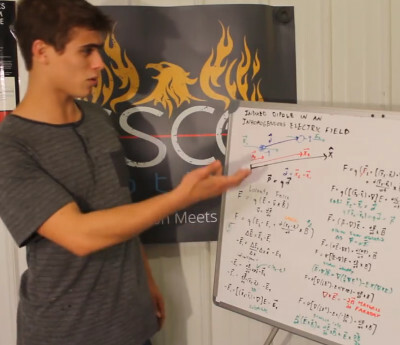 After a year away from YouTube, the ever-energetic [Styropyro] has returned with whiteboard in hand to remind us just how little we actually know about lasers. In the last month he’s really hit the ground running with plenty of new content, but one video of his particularly stands out: a practical demonstration of laser levitation. Even better, unlike most of his projects, it looks like we can replicate this one without killing ourselves or burning our house down! For those unaware, laser levitation is probably as close as we’ll get to Star Trek-style tractor beams in our lifetimes. In fact, the NASA Innovative Advanced Concepts program has been examining using the technology for capturing small particles in space, since it would allow sample collection without the risk of physical contamination. While the demonstration [Styropyro] performs lacks the “tractor” part of the equation (in other word’s, there’s no way to move the particle along the length of the beam) it does make us hopeful that this type of technology is not completely outside the reach of our home labs. The trick seems to be with the focus of the laser beam itself. Your average laser pointer just doesn’t have the appropriate beam for this kind of work, but with a diode pulled from a DVD burner and a driver circuit made from parts out of the junk bin, the effect can be demonstrated very easily as long as you can keep the air in the room extremely still. Of course, what you’re trying to pick up is also very important, [Styropyro] has found that synthetic diamond powder works exceptionally well for this experiment. At about $1.60 a gram, it won’t break the bank either. So how does it work? With a few trips to the aforementioned white board, Professor Pyro explains that the effect we’re seeing is actually electromagnetic. If the particle you want to levitate is small enough it will become polarized by the light, which is in itself an electromagnetic wave. Once you’ve got your mind wrapped around that, it logically follows that the levitating particle will experience the Lorentz force. Long story short, the particle is suspended in the air for the same reason that a projectile is ejected from a rail gun: if you’ve got enough power and the mass of the object is low enough, there will be an observable force. We’ve been covering the work of [Styropyro] for years now, and are glad to see him back on YouTube creating new content and terrifying a new generation of viewers. Between this and the return of [Jeri Ellsworth], it’s like we’re experiencing a YouTube hacker Renaissance. Amuse your friends, amaze your enemies, and perplex ants and other insects, insofar as they are capable of perplexment. Accomplish all this and more with this handy dandy homebrew acoustic levitator. Before anyone gets to thinking about using this technique to build a hoverboard that actually hovers, it’s best that you scale your expectations way, way down. Still, being able to float drops of liquid and small life forms is no mean feat, and looks like a ton of fun to boot. [Asier Marzo]’s Instructable’s post fulfills a promise he made when he first published results for what the popular press then breathlessly dubbed a “tractor beam,” which we covered back in January. This levitator clearly has roots in the earlier work, what with 3D-printed hemispherical sections bristling with ultrasonic transducers all wired in phase. A second section was added to create standing acoustic waves in the middle of the space, and as the video below shows, just about anything light enough and as least as cooperative as an ant can be manipulated in the Z-axis. There’s plenty of room to expand on [Asier]’s design, and probably more practical applications than annoying bugs. Surface-mount devices are pretty tiny — perhaps an acoustic pick and place is possible? Levitating chairs from the Jetsons still have a few years of becoming a commercial product though they are fun to think about. One such curious inventor, [Conor Patrick], took a deep dive into the world of maglev and came up with a plan to create a clock with levitating hands. He shares the first part of his journey to horizontal levitational control. [Conor Patrick] bought an off-the-shelf levitation product that was capable of horizontal levitation. Upon dissecting it he found a large magnet, four electromagnet coils, and a hall effect sensor. These parts collectively form a closed-loop control to hold an object at a specific distance. He soon discovered that in fact, there were just two coils energized by H-bridges. His first attempt at replicating the circuit, he employed a breadboard which worked fine for a single axis model. Unfortunately, it did not work as expected with multiple coils. After a few iteration and experiments with the PID control loop, he was able to remove unwanted sensor feedback as well as overshoot in control current. He finally moved to a Teensy with a digital PD loop. The system works, but only marginally. [Conor Patrick] is seeking help from the control loop experts out there and that is the essence of the OSHW world. The best part of this project is that it is a journey that involves solving one problem at a time. We hope to see some unique results in the future. We have covered Acoustic Levitation in the past and the Levitating Clock on a similar beat. We’re certain a more refined approach is on the horizon since many of us are now looking at making one to experiment with on our workbench.